There is not a single organic chemist who has never experienced the burden of tedious, labor-intensive, time-consuming synthesis optimization conditions. Nature of substrate, nature of catalyst, reaction time, temperature, pressure, molar equivalents, pH, scale of reaction, all are parameters that can greatly influence final yields, purity, and stereoisomer composition. If, through one type of combination, the obtained result is not satisfactory, one just starts all over again, fine-tuning the experimental parameters one at the time. In order to circumvent these barriers to innovation, MIT researchers have developed an automated chemical synthesis system that aims at freeing up synthetic chemists for them to spend time on what really matters: innovation, creativity, discovery and development. 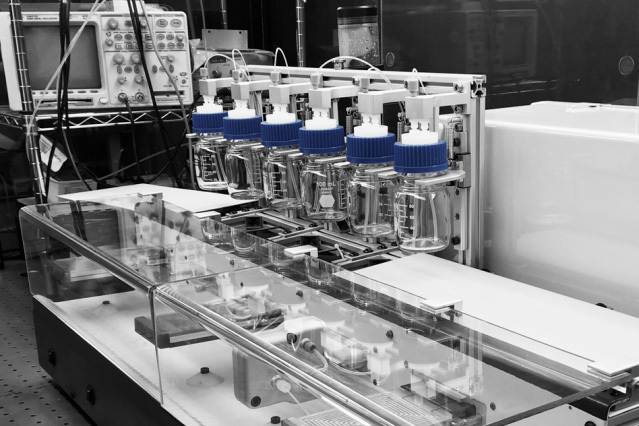 The system integrates all three combinations of hardware (flask & piping), software (selection of reagents, reactors, separators) and analytics (HPLC, GC/MS, spectroscopy). The system has shown aptitudes for an array of chemically different reactions, from substitution (SNAr) to cross-coupling (C-C and C-N), through photoredox catalysis (and not forgetting olefinations, reductive aminations, multistep sequences...). The system operates in continuous flow mode: in flow chemistry, pumps move reagents thought tubes. When they join one anther at some point, the reagents – if reactive – can undergo a chemical reaction. « Our goal was to create an easy-to-use system that would allow scientists to come up with the best conditions for making their molecules of interest — a general chemical synthesis platform with as much flexibility as possible,» states Timothy F. Jamison, head of MIT’s Department of Chemistry and one of the leaders of the research team. This system could cut the amount of time required to optimize a new reaction, from weeks or months down to a single day, the researchers say. The present system comprises five such bays, and six different modules have been developed thus far: a heated reactor (up to 120°C), a cooled reactor (to -20°C), a light-emitting diode (LED) based photochemistry reactor, a packed-bed reactor (for solid supported reagents and catalysts, as well as passive mixing), a membrane-based liquid-liquid separator (purification via extraction), and a bypass (for reagent addition in a minimal volume, mixing, or unused bay). A Suzuki-Miyaura cross-coupling was performed using SiliCycle SiliaCat DPP-Pd, our mess-free heterogeneous catalyst! Optimization of the reaction between 3-bromopyridine and phenylboronic acid to yield 3-phenylpyridine was performed in order to the select best experimental conditions for this Suzuki-Miyaura catalyzed by SiliaCat DPP-Pd. 30 experiments were performed (for a total of 8 hours) and 4 variables were played with (molar equiv., temperature, reaction time, catalyst charge). Under the final optimized conditions (1 equiv. of boronic acid, 1.0 equiv. of organohalide, 4.0 equiv. of K2CO3, 63°C, 2.54 min), 9 other substrates were tested to yield final products in very good yields (84 - 98 %). Substrate scope and synthesis of 1 g of 10 different substituted biphenyls were performed in less than 8 hours! The researchers are now working on a new version covering even more aspects of organic synthesis design, including new type of modules to be used.